Illustrator Jessica Milne begins her hands-on demonstration by briefly discussing the process of illustrating children’s books and what it is like to work with a publishing house. To understand the process of illustrating, Jessica has prepared a simple, yet fun exercise for the students to become illustrators themselves for the day. Jessica inspires the most reluctant artists to discover they can draw and paint. Basic concepts of drawing will be introduced as well as the technique of how to use watercolour pencil crayons. All art materials are included in the presentation. Each student will receive their image mounted on a beautiful greeting card. Session is 45-50 min and is designed for individual classrooms, Kindergarten to Grade 5. ​Please contact Jessica for rates. "Jessica Milne recently delivered a drawing/painting lesson with my kindergarten class. The children were directed to draw owls, colour them with pencil crayons and paint using water. I was absolutely amazed at the results. As I walked around observing my students engaged in the activity, I could not get over the quality of the work that I was witnessing. The results were spectacular. I have a few students with very weak fin-motor skills and many with poor listening skills. 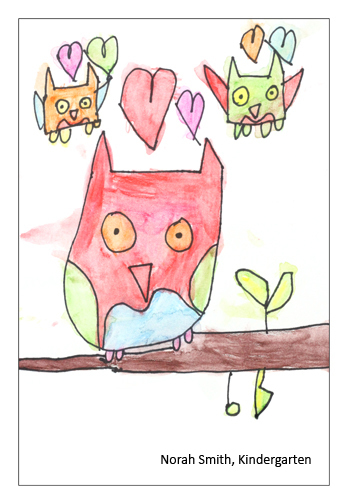 All of them were able to produce a clear and creative image of an owl. They were really quite beautiful. Each and every one looked like it should be published in a magazine. Special thanks to Jessica! I am still excited about the results and look forward to a time when I can, once again, invite Jessica to work with my “budding” little artists."